If you are lucky enough to have a very good cook as a friend or partner, you’ve probably watched them work with recipes. If she or he is making a meal, a good cook will adjust the recipe as they go. They might substitute ingredients, use different spices according to their preferences (or more likely the preferences of the people who will be eating the food), and check the food for doneness, texture and taste. Good cooks know that recipes are guidelines, not commandments. The cook adopts the recipe, and then adapts it to fit their dinner guests’ preferences and their entertainment plans. Likewise, service management professionals have learned to adopt one or more frameworks and adapt to the needs of their organization. If, on the other hand, they are baking something complex, they read the recipe and measure everything very carefully. Baking is applied chemistry, and small variances in the amounts of ingredients, or even the order in which they are added together, can make a large difference in the result. Methodologies are a bit more like baking: Not following the prescribed, tested steps carefully can produce failures or have unintended consequences. The client quote above is an extreme example, to be sure, but still there are those who think that investing in education about frameworks (and methodologies too) provides a silver bullet that magically produces better results. The road of service management is littered with those who mistook frameworks for commandments. For frameworks, there isn’t a by the book way to do things. Frameworks document the practices that have made organizations successful over a period of time, in the form of guidance. They are often considered best practice, but are certainly not the only practice. Furthermore, what’s best for other organizations might not be best for yours. The road of service management is littered with those who mistook frameworks for commandments. Recipes might produce a bad result for several reasons. For example, did you know that water boils at 193°F at 10,000 feet of altitude, not at 212° as at sea level? If your recipe depends on boiling water to cook something, the time will likely have to be adjusted because the temperature is lower at high altitude. (And yes, I do have a friend who lives at about 10,000 feet in the Rockies.) Your stove may read 375° but really only be at 365°. The pan you selected may not transmit heat at the same rate as the one the recipe’s author used. And so on. This is why cooks who know their business heavily annotate the recipes they’ve used, adjusting everything from the amount of some ingredients to the length of time it takes to cook. 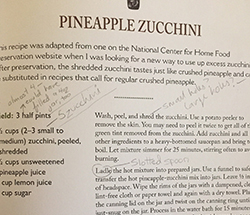 (The accompanying picture shows a recipe annotated by the cook, showing that she needed 5 zucchini, not the 2–3 the author stated.) Good cooks check, tinker, add, taste, and modify. They do this each time they prepare the dish so that the outcome (i.e., the food) continually improves. Inexperienced cooks may say that “the recipe didn’t work” when in fact the conditions under which the food was prepared were likely different. Consider which frameworks and methodologies would be beneficial to your organization. Ask around (using, for example, the Ask Your Network area of HDIConnect) to see what has worked for other organizations like yours. Above all, remember to adopt and adapt the given guidance to suit your organization’s culture and desired outcomes. Learn more about service management frameworks and methodologies at Service Management World.